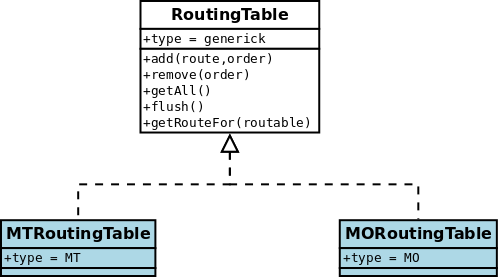 There’s one MORoutingTable and one MTRoutingTable objects holding respective routes for each direction (MT or MO), these are Route objects that hold one or many Filter (s) objects and one destination Connector (or many connectors in some specific cases, c.f. Multiple connectors). As explained by the above routing process flow figure, for each message and depending on its direction, a routing table is loaded and an iterative testing is run in order to select a final destination connector or to reject (returning no connector) it, routes are selected in descendant order, and their respective filter objects are tested against the Routable object (It is an extension of the low-level SMPP PDU object representing a message, more information in Routable). The route order is very important: if we swap last both routes (#90 and #91) we will run into a shadowing route where all MT messages sent by a user in group G2 will be routed to smpp_3, no matter what time of the day it is. In this example, there’s no DefaultRoute, this will lead to message rejection if none of the configured routes are matched. Route’s rate are discussed in Billing. The router components are mainly python objects having the unique responsibility of routing messages to Jasmin connectors. The Routable class is extended by child classes to hold necessary information about the message to be routed. All routables provide a tagging api through the addTag(), hasTag(), getTags(), removeTag(), flushTags() methods, this feature is mainly used in the interceptor, there’s a concrete example of such usage here. The Connector class is extended by child classes to represent concrete HTTP or SMPP Client connectors. The Filter class is extended by child classes to define specific filters which are run by Jasmin router to match a desired Routable, every filter have a public match(routable) method returning a boolean value (True if the filter matches the given Routable). As explained, filters provide an advanced and customizable method to match for routables and decide which route to consider, the figure below shows the Filter implementations provided by Jasmin, you can extend the Filter class and build a new filter of your own. ConnectorFilter: MT Messages are not coming from a connector, they are sent by a known user/group. A Route class holds one or many filters, the matchFilters(routable) method is called to match the given routable against every filter of the Route (using AND operation when there’s many filters), if the matching succeed, the Jamsin router will ask for the Connector to consider by calling getConnector() method which will return back the Route ‘s connector. 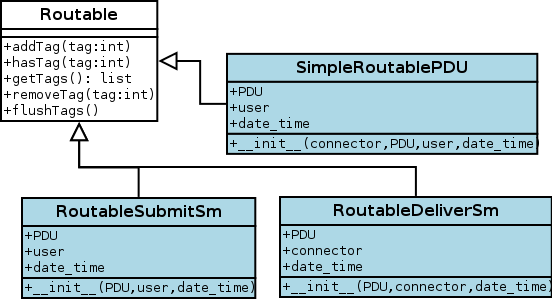 When extending Route class, it is possible to customize the behavior of the route and that’s what RoundrobinMORoute and RoundrobinMTRoute do, they are initially provisioned with a set of connectors, and the getConnector() method is overloaded to return a random connector from it; this can be a basic usage of a load balancer route. 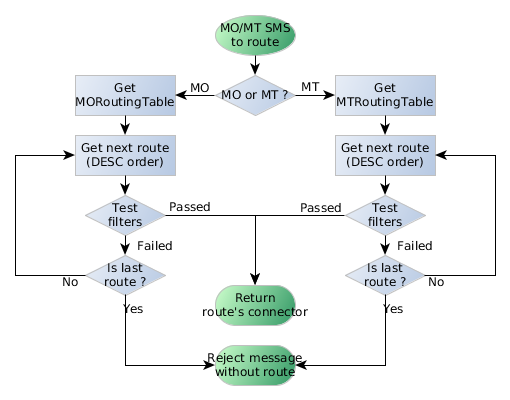 The newly added (Jasmin 0.9b10+) has new FailoverMORoute and FailoverMTRoute routes, they are also extending the Route class to provide failover on top of multiple connectors. 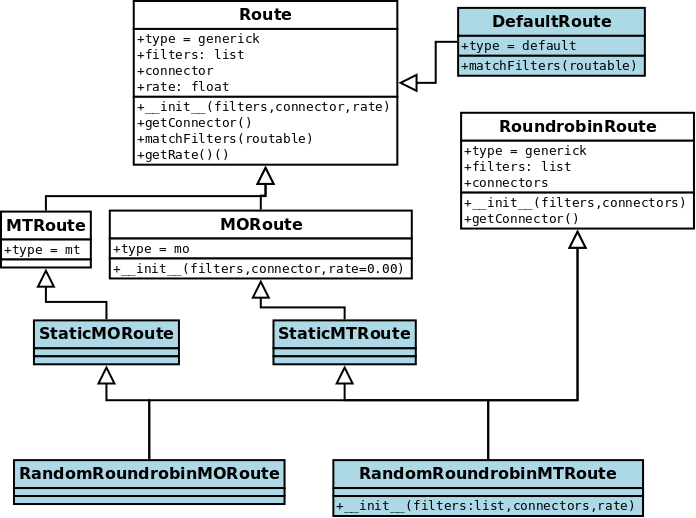 The getRouteFor(routable) will get the right route to consider for a given routable, this method will iterate through all the provisioned routes in descendant order to call their respective matchFilters(routable) method. © Copyright 2014-2019, Jasmin Revision 75897bb3.